So it doesn’t really matter that I’ve never been. What matters is, I know I’d love it if given the chance to go to New Orleans. I mean, how could I not? It has history. And graves are above ground. And it has Cajun food. And boy, do I love Cajun food. Hello, authentic red beans & rice! Real-deal jambalaya! And mint juleps. I’ve always wanted to try one. Yeah, I realize I could get a mint julep anywhere, but I want one in New Orleans. Don’t judge my dreams. Everyone knows yesterday was Mardi Gras, or Fat Tuesday, or Eat-Whatever-The-Hell-You-Want-Day, and I definitely saw this as cause for a tremendous Cajuntacular feast. Yup, I also just said ‘Cajuntacular.’ Try not to get too jealous. 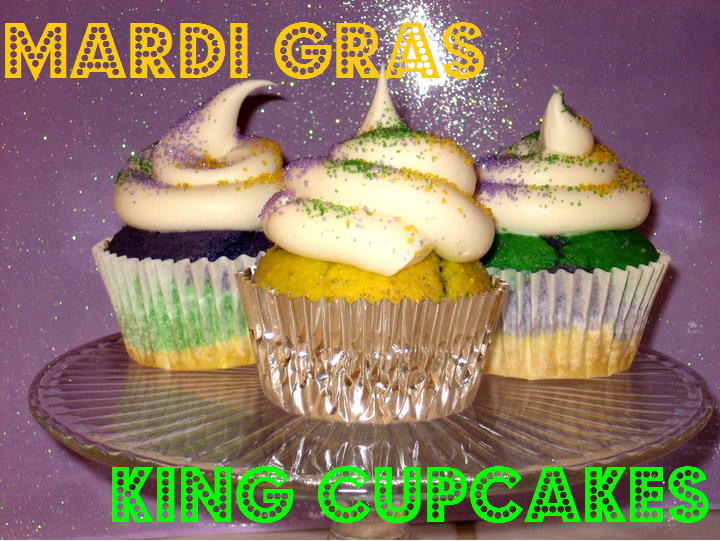 Along with making a really yummy dinner of shrimp po’boys, dirty rice, corn and black eye peas, I also made some shrimp beignets (which will show up in my next post) and some of these fabulous Mardi Gras King Cupcakes. Just in case you want to hear a super-cool history lesson, the King Cake is traditional for Mardi Gras. 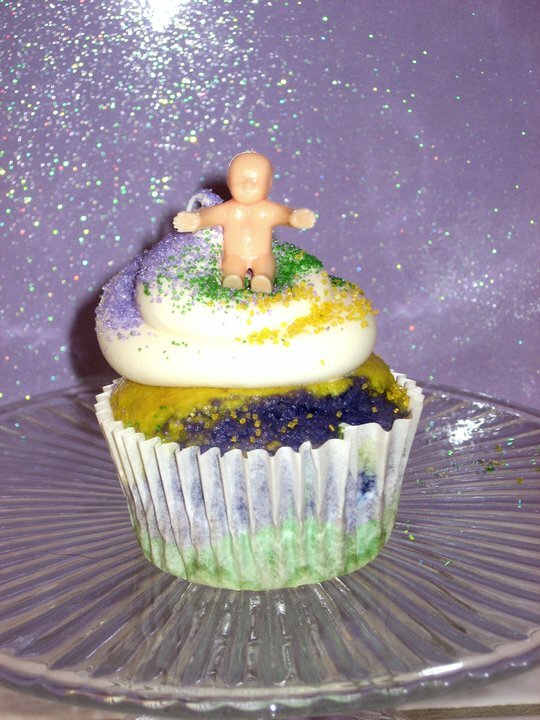 In authentic King Cakes, a small baby is baked inside. Saying goes, if you get the slice of cake with the baby, you’d have good luck. But since I typically don’t like to play favorites, I decided everyone should have the equal opportunity of snagging the baby, so I only put a single baby figurine on one cupcake and let ’em have at it. All’s fair in superstitious dessert making and eating. Also, seeing as Mardi Gras is this huuuge celebration, I wasn’t going to make some ordinary cupcake with purple, green and gold sprinkles. Do I look ordinary? So I dyed the batter three colors (purple, green, and yellow-gold) and tie-dyed the cupcakes for that super cool, super festive Mardi Gras look [for a complete cupcake tie-dying tutorial, click here]. Once cooled, I frosted them with vanilla icing and topped with the festive sugars. So yummy. And then I devoured them. TODAY I STUMBLED UPON YOUR BLOG. BTW..LOVE IT! I HAVE 1 SMALL REQUEST THOUGH. IN THIS KINGCAKE CUPCAKES RECIPE..PLEASE CHANGE” A SMALL BABY IS BAKED INSIDE EACH CAKE OR CUPCAKE” TO READ, “A SMALL PLASTIC BABY OR BEAN IS BAKED INSIDE”.I CAN’T WAIT TO READ SOME MORE RECIPES FROM YOU.I AM GOING TO MAKE LEMON POUND CAKE TOMORROW(I NEED TO GET SOME INGREDIENTS)OR I WOULD HAVE MADE IT TONIGHT.LOOKING FORWARD TO READING MORE OF YOUR BLOG ASAP.